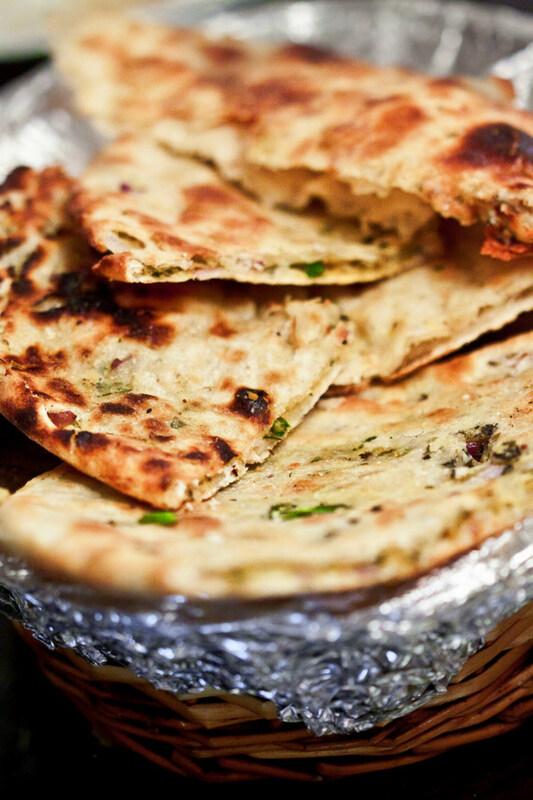 Fresh-baked Punjabi Kulchas remind me why I love bread so much. Nothing can trump fresh baked hot bread other than...fresh baked hot STUFFED bread. 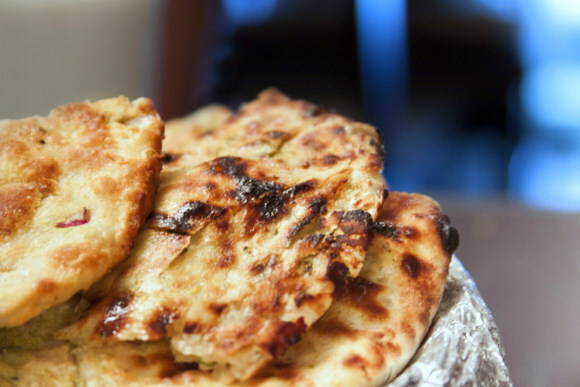 These flour-based tandoor-baked babies were first popped out in Punjab, where some brilliant bread-loving genius decided to stuff starch in more starch, and create what is now hailed as the traditional potato-stuffed kulcha. 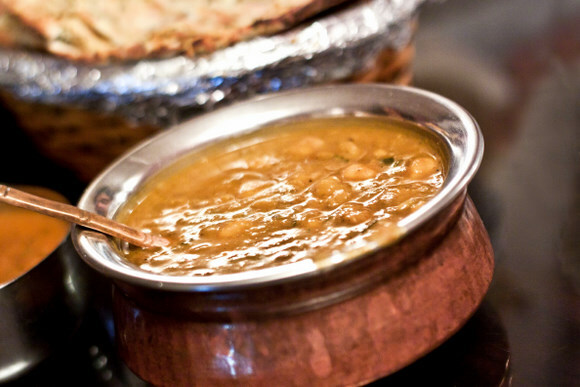 Tradition demands that you tear off a piece of the aforementioned glorious kulcha, dunk it into a fiery bowl of chole (chickpea) gravy, and prepare to become a mouth slave to the spicy gravy-drenched potato stuffed bread. Now Kulcha King doesn't just shove masala-stuffing into their kulcha, but as thoughtfully dissected by Kook, they sprinkle the surface liberally with what tasted suspiciously similar to salt and lemony chaat masala. It gives you this massive flavor oomph! even before you've got to the core of the kulcha. The Potato Kulcha. The traditional way to make a kulcha, stuffed with spiced potatoes that become steamy hot and mushy after the heat blast in the oven. All I can say is, don’t flout tradition here, because that potato kulcha will BLOW. YOUR. MIND. This was the king of all the kulchas we tried. I’d want to knit a bunch of them together – like thousands of these soft pillowy potato oozing kulchas together – and use the now life-sized kulcha to replace my bedroom down comforter and tuck me into bed each night. Cozy kulcha snooze. The Special Lacha Stuffed Kulcha. 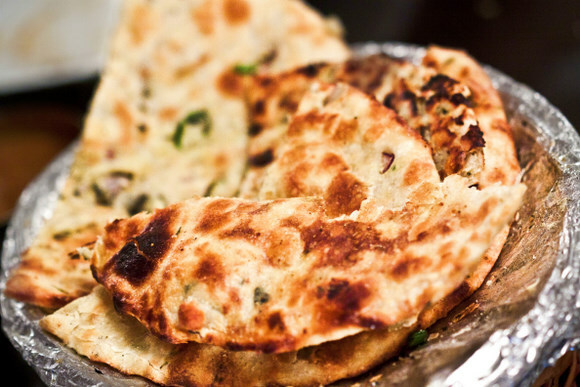 What do you get when you cross a paratha with a kulcha? 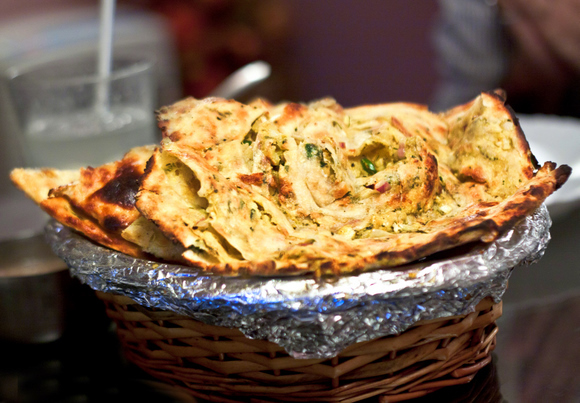 The Lacha Kulcha, or layered kulcha. The kicker in this one was the crackly thin concentric circles of fried kulcha skin on the outside. 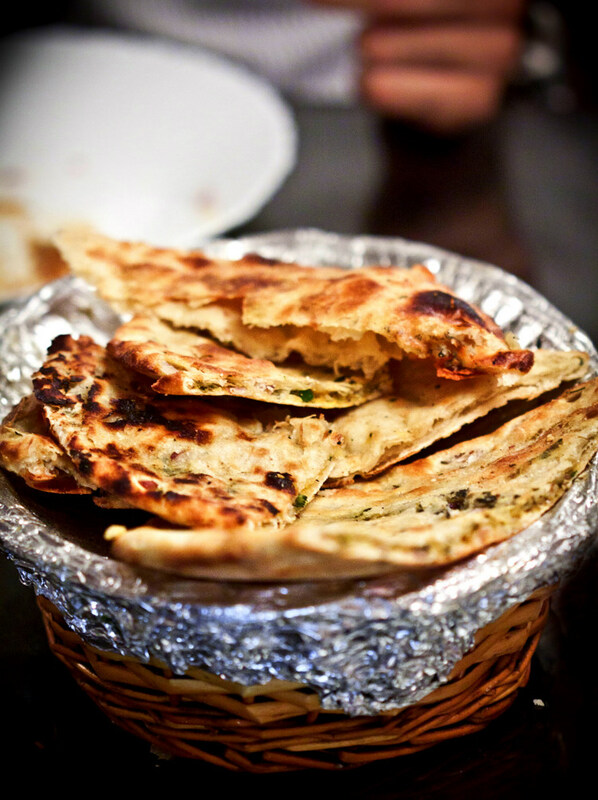 Our Punjabi friend and kulcha purist on the table frowned down at this hybrid improvised version of the kulcha. ...And then promptly proceeded to crunch into a piece anyway. The Onion Kulcha. And the Keema Kulcha. I write these two together because nothing about the stuffing - onions in the first, and minced meat in the second, really stood out as being distinctive. You would think that bastardizing any tradition with minced meat would, by definition, make it even more awesome. But I've said it once, and I'll say it again: THE POTATO KULCHA IS KING. The Cheese Kulcha. Here we have a particularly obnoxious violation of sacred kulcha tradition...stuff it with CHEESE. We're not even talking Indian paneer, this was store-bought cheese. But tradition or not, daaaaamn it was good. They hadn't gone overboard, just a thin layer of smooth salty, slightly sour cheesiness. And if someone hadn't once thought of polluting a perfectly good piece of crust with a heap of cheese, we'd never have discovered pizza now would we? To wash it all down, a tall glass of thick creamy salted lassi. Not made by sturdy Punjabi hands as tradition would hold, but still as creamy as what you'd expect a mechanized mixer to churn out. There. I have renewed my vows to bread. Reaffirmed my love. Photographed the heck out of them kulchas. I really should start a new blog as a tribute to bread and bread alone. Or maybe just stop blogging altogether and use the time to…eat more bread. ← Older: Happy Birthday to a Fantabulous Community of UAE Food Bloggers! Arva, will take you to a place near Charminar when we are together in Hyderabad next (if that place still exists), where we use to have cold sweet thick lassi – flavor of which I still can feel in my mouth when I think of it. I also think you must take a month’s vacation from writing about food for Ramadan, as many will get tempted and break their fast thinking of your mouth-watering experiences and photographs. @saleem – oh my goodness, YES YES YES TAKE ME!!! 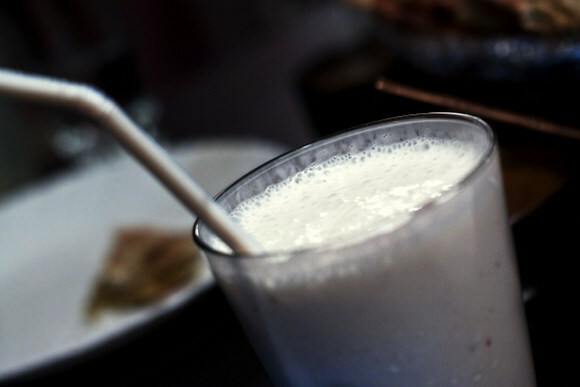 I want charminari lassi, this is going to have to happen on our next Hyderabad trip! 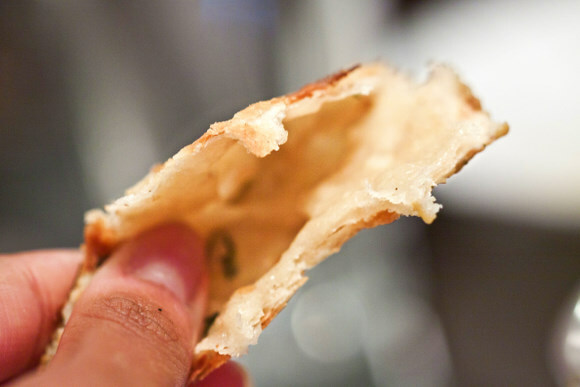 @FooDiva – avoid bread?!?!? GASP. 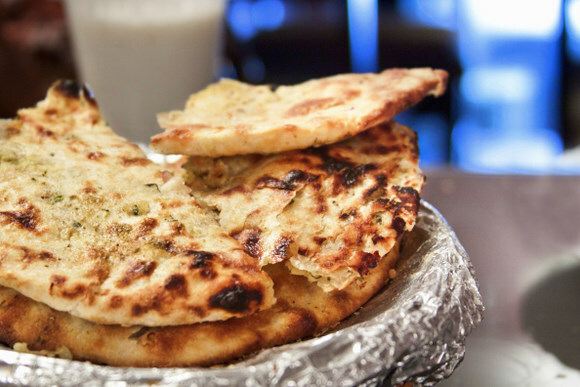 Have a kulcha and then we speak again. I love your blog. You have such great recipes, my mouth is watering just seeing the pictures. Now I have to make something Punjabi to satisfy the craving! @mustardseedmeadow – thank you! 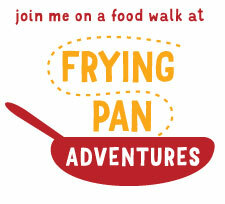 I just hopped over to your blog too, mutual drooling action going on here ;) did you end up making anything Punjabi? ?